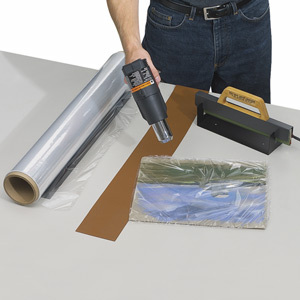 This shrink wrap protects and displays art quickly and economically. Simply remove one sheet from the roll, wrap the art and backing, and shrink the film with a heat gun. A heat sealer is helpful for trimming away excess plastic, but is not absolutely necessary. Another heat source,such as a low-powered household iron, can be used, although the results may not be as neat or professional.